Miracles are the life of Jesus Christ manifested in people. My father is passionate about sharing the secrets that have resulted in success and effectiveness for the Osborn global ministry for over six decades. We have taught the truths in this book to people of nearly every major religion on earth. These truths have brought miraculous results in every nation and culture where they are taught. 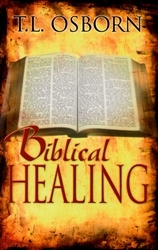 As you read these pages, expect to experience the Biblical Healing that has been received by so many people worldwide. The dynamics in this book were first published in Java, Indonesia, in 1954. Biblical Healing has been translated into more languages than any other book we have written. It continues to facilitate miracles. Tens of thousands of people have been healed while reading this book because these truths create biblical healing. This enlarged edition includes: Our Four Vital Visions, over 70 years of Our Miracle Witness, plus 324 linked Bible versus that comprise Christ’s healing ministry. These essential truths are made indelibly clear: God’s Divine Will, Satan’s Total Defeat, Self Discovery in Christ and Healing for You.